This E240 hydraulic crawler excavator is a safe and cost-effective construction machine. The main components of this hydraulic digger are equipped with international famous brand products. This E240 hydraulic crawler excavator adopts advanced ESS electric control system with three power control modes to meet the requirements of different working conditions. Vehicle-mounted remote control system with GPS makes maintenance much faster and more convenience. This reliable and durable hydraulic crawler digger has a capacious and comfortable driving cabin with broad field of vision. 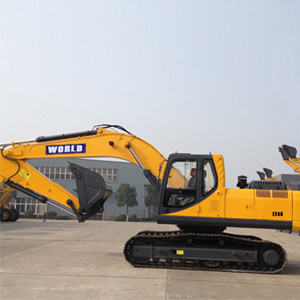 World Equipment Co., Ltd, is a professional manufacturer and supplier of hydraulic crawler excavator, or hydraulic crawler digger in China. We supply all kind of construction and engineering equipments like wheel loader, road rollers, crawler excavator, and other products. We assemble our quality components according to the ISO quality management system, and all our products are all manufactured in strict accordance with ISO14001 environmental management standard. As the matter those advantages, our hydraulic crawler excavators, or hydraulic crawler diggers are widely exported to Russia, Brazil, Congo, Ghana, Nigeria, Gambia, Kenya, and Tanzania and gain high reputation among our customers.